Jailbreaking is an essential part of the iOS experience for many. For others, it’s unknown and dangerous. Thankfully, for those new to jailbreaking, there are multiple ways to do it. Whether you’re a hardened veteran of jailbreaking, or this is your first time trying it, this guide will help you jailbreak your iPhone, iPod touch, or iPad. Jailbreaking your iPhone or iPad is a risky process that we can’t unreservedly recommend, but it remains popular among those who wish to install unofficial apps and tweaks on their smartphone or tablet or ipad. So i cant guarantee that after reading this article you will successfully jailbreak your iphone, ipad or ipod or not. If anything goes wrong then we cannot be responsible for this. What is Jailbreaking Your iPhone or iPod or iPad means? To “jailbreak” your iPhone, iPod or iPad means you are freeing it from the limitations imposed by Apple. It is similar to ‘Rooting’ in a android device. Freeing a device means that it can install applications from outside Apple’s iTunes App Store and you can fiddle with previously restricted aspects of an iOS device. Jailbreaking can also help you unlock your iPhone to make it available on other carriers. 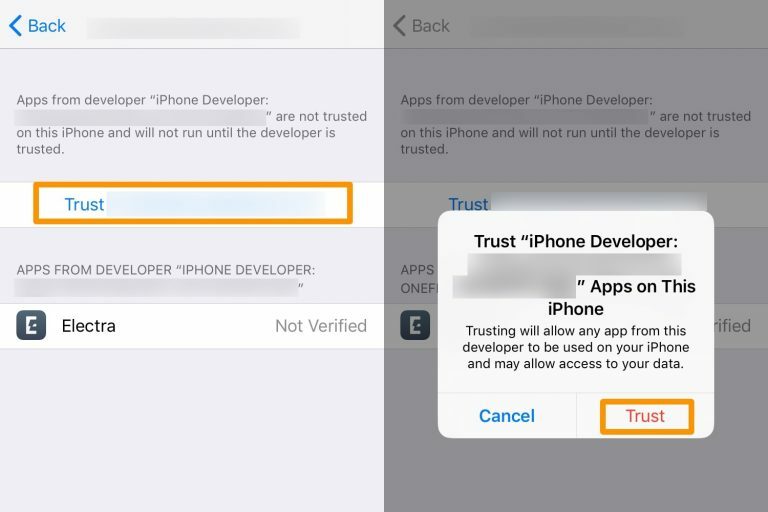 Simply it means bypassing the locks put in place by Apple on its iPhones and iPads and thus gaining access to a large number of apps that have not been authorised by Apple. When it comes to jailbreaking a device, it’s always best to back up while you can. iTunes should automatically back up your device every time you plug it in. Be sure to run a backup of your device before beginning the jailbreak process so that all your precious music, apps, movies, and everything in between are successfully stored on your computer. That way, once you complete the jailbreak process, you can run a restore and get everything back. Just make sure you’ve plugged into iTunes recently and synced your device. Running a sync will backup your device by default. Important Points To Note Before Following The Guide To Jailbreak iPhone, iPad or iPod 2018. ENABLE AEROPLANE MODE : Coolstar has recommended enabling Airplane mode before using Electra Jailbreak. Access the Control Center, and tap on Airplane toggle to enable it. DISABLE SIRI MODE : Coolstar has also recommended disabling Siri mode before using Electra Jailbreak. Launch the Settings app and navigate to Siri and Search, and tap on Listen for “Hey Siri” amd Press Home button for Siri or Press Side Button for Siri toggle and tap Turn Off Siri. 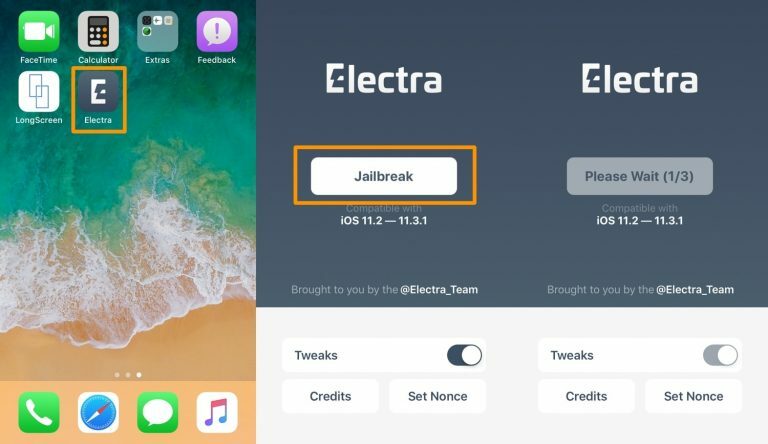 Coolstar has finally released the much anticipated Electra Jailbreak tool to jailbreak iOS 11.3.1 – iOS 11.2. In this tutorial, we will provide you with 100 % working step-by-step guide to jailbreak iOS 11.3.1 – iOS 11.2 using Electra Jailbreak on your iPhone, iPad or iPod touch. 3) Connect your iPhone, iPad, or iPod touch to your computer with an MFi-certified Lightning cable. Note: Cydia Impactor should recognize your device. If it does not, make sure to “Trust” your computer from your device via the pop-up, and vice-versa. 5) Sign in with your Apple ID when prompted. 6) Cydia Impactor will now begin installing the Electra jailbreak app on your device. 7) Once installed, go to Settings → General → Profiles & Device Management and tap on your Apple ID. 8) Next, tap on the blue Trust button, and then tap on the red Trust button inside the popup that appears. 9) Now launch the Electra Jailbreak app from the homescreen and then tap on Jailbreak button to start the jailbreaking process. It will go through 3 stages. After the second stage, your device should respring. Please note that on iOS 11.3-11.3.1, the device will reboot twice and Electra will need to be re-run after the first reboot. Note : Cydia should also be installed on your Home screen. You should be able to launch it and install the jailbreak apps and tweaks. If you don’t see Cydia on the Home screen, then launch Electra Jailbreak and keep trying until it works. You may need to try several times for it to work. And that’s all. You’ve successfully jailbroken your iOS 11.2-11.3.1 device. Whether your victory dance involves Tebowing or not is up to you, but you have successfully completed the jailbreak and restore process for your iOS device! Be sure to run Cydia and check out all the amazing new apps and tools you can use! Once you’ve completed the jailbreak process , it’s important you take the time to restore all your precious data back onto your iOS device. Simply plug your iPhone, iPad, or iPod Touch back into iTunes, and it will do the rest. By the time your restore is finished, iTunes should have successfully placed all your apps, music, photos, and precious data where it belongs.